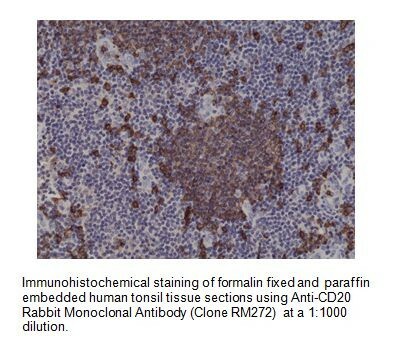 Anti-CD20 Rabbit Monoclonal Antibody | A1594 | BioVision Inc. Monoclonal antibody to detect CD20 in human samples. It is a non-Ig differentiation antigen of B-cells and its expression is restricted to normal and neoplastic B-cells, being absent from all other leukocytes and tissues. CD20 is expressed by pre B-cells and persists during all stages of B-cell maturation but is lost upon terminal differentiation into plasma cells. 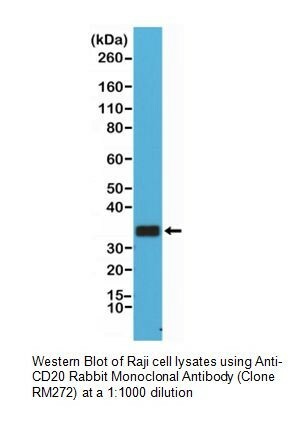 This mAb can be used for immunophenotyping of leukemia and malignant cells, B lymphocyte detection in peripheral blood and B cell localization in tissues. It reacts with the majority of B-cells present in peripheral blood and lymphoid tissues and their derived lymphomas. In lymphoid tissue, germinal center blasts and B-immunoblasts are particularly reactive. 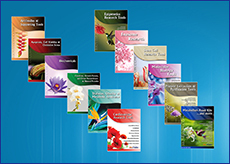 It is a reliable antibody for ascribing a B-cell phenotype in known lymphoid tissues. Rarely, CD20-positive T-cell lymphomas have been reported. Reactivity has also been noted with Reed-Sternberg cells in cases of Hodgkin s disease, particularly of lymphocyte predominant type.